An eBay seller is obligated to describe the item honestly and in detail. 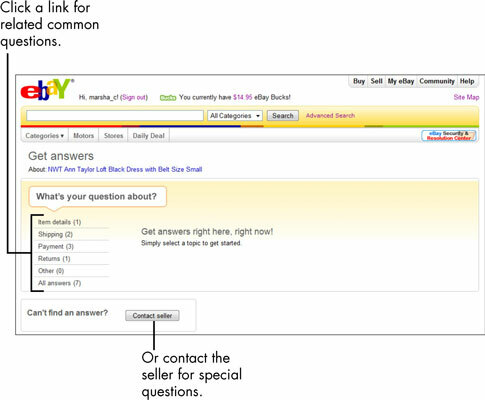 You can ask an eBay seller a question if it isn’t answered in the item description or in the pictures provided. 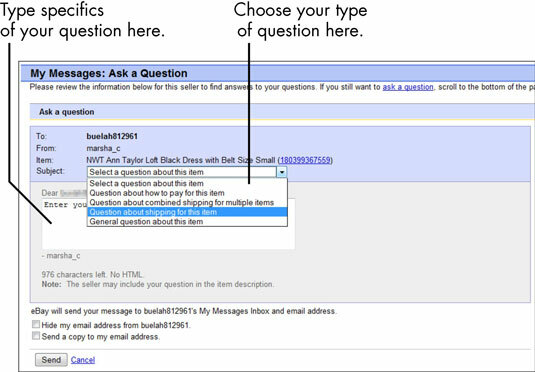 To ask a seller a question, click the Ask a Question link in the Seller Info box. You’ll be taken to a page that has links to common questions. Click the question that matches your query and see whether it’s been answered. If not, click the Contact Seller link. When you click the Contact Seller link, a form that appears. Select the type of question you have and then write your questions in the message area. When you’re finished, click Send. Expect to hear back from the seller within a day. If it takes the seller more than a day or two to respond (unless it’s over the weekend — eBay sellers are entitled to a little rest), and you get no explanation for the delay, think twice before shelling out your cash. Be sure to ask any questions you have before you bid. If you wait to ask questions until after you’ve won the item, you may get stuck with something you don’t want. Double-checking can save you woe and hassle later. If you make a purchase and find out that the seller misrepresented the item in the description, you have the right to request to return the item or get a refund from PayPal. If you buy the item and discover that you overlooked a detail in the description, then the seller isn’t obligated to take the item back. If it is the seller’s error and the seller won’t take back the item, you may be able to apply for a refund through PayPal’s Buyer Protection. You’ll often come across auctions that have the words Reserve not met next to the bid amount. By placing a reserve on the auction, the seller ensures that the item doesn’t sell until the bidding reaches the mysterious reserve figure. The point of the reserve is to protect the seller’s investment and attract qualified bidders, not to waste your time. If you’re bidding on a reserve-price auction, don’t be afraid to e-mail the seller and ask what the reserve is. Yeah, reserves are mostly kept secret, but there’s no harm in asking — and many sellers are glad to tell you.